It is here, as if Don Giovanni thinks about the terrible threat of the Commendatore;�However, he has eventually the numbing pleasure in finding his imperturbability.�Compare the notes at bars 1 and 379.
performed quite "a fior di labbro" (on the threshold of the lips). fà preparar. für sie bestellt. cerca a menar. so es dir gefallt. farai ballar. tönen ans Ohr. vò amoreggiar. nehm ich mir vor. devi aumentar! tragst du noch ein! A big party stand ' ordered for you. hit in the market a pretty child you, take it with you, as it pleases you. Exuberant dances, here Sarabandes here the courantes, here minuets sound to your ear. And meanwhile soon those on their own account, I'll intent. Yes, my register should expand, with a dozen names! 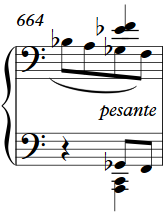 The "Tempo" should follow the performance of a virtuosic and tasteful singer. 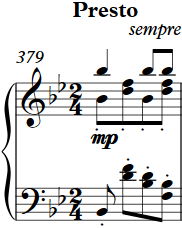 The editor recommends the maximum speed only for the last occurrence of the main theme.